This server encapsulates the principles of elegance through simplicity of form and decoration. The blade celebrates the high polish that silver takes while its satisfyingly solid mass is rendered light through the central opening and twenty one drilled decorative holes. The sense of delicacy combined with strength is carried up into the arched handle which echoes the curvaceous lines of the blade. Michael McCrory has achieved a harmony of form and function, sculptural presence and line. The lyre shaped blade is sharpened on the ends and the blade halves are strengthened by a sub-surface join towards the front end. The blade carries a simple decorative design of pierced holes that outlines its inner division. An anticlastic hollow handle rises up at an acute angle at the rear. It curls forward so that the hand is over the blade, the long extent of which provides a considerable useful surface. 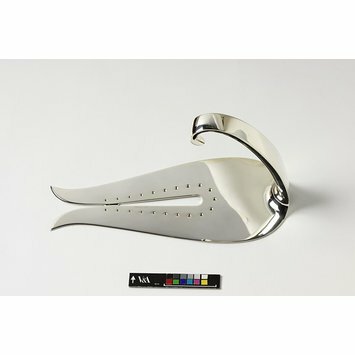 Part of a collection of fish slices commissioned by Professor Rabinovitch from contemporary North American and British makers. 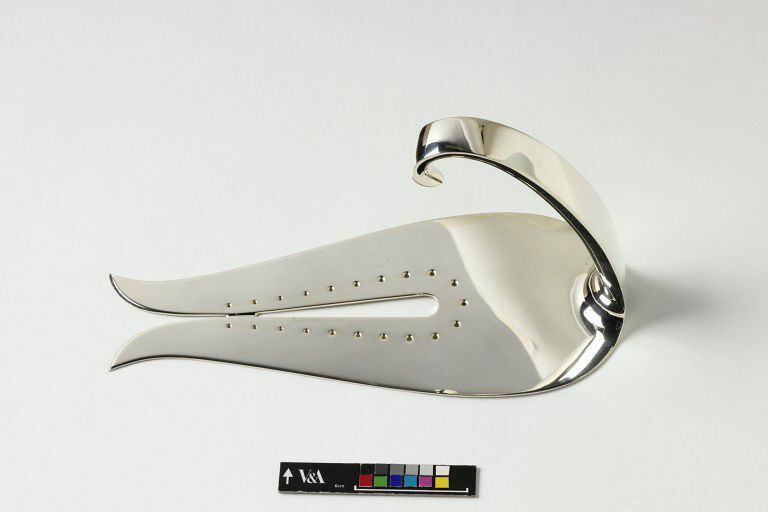 This collection of silver slices, all commissioned over a period of twenty years by Professor Benton Seymour Rabinovitch FRS, is proof of the skill and diversity of contemporary silversmiths. Each artist craftsman has responded to the familiar functional form of the slice in an individual way, producing an astonishingly diverse range of interpretations. Each piece becomes an enchanting, decorative work of art. Professor Rabinovitch established a close rapport with each artist, always encouraging a freedom of creative expression. The response of these silversmiths has been not only to be strikingly imaginative but also to honour him by giving him their best work.